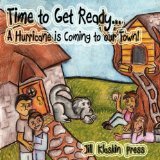 Time to Get Ready… A Hurricane Is Coming to Our Town! Hurricanes can be frightening to kids, especially when they don’t know what to expect. What can they do to help prepare for the storm? Will they need to evacuate? In Time to Get Ready… A Hurricane Is Coming to Our Town! the family is preparing for a hurricane. They board up windows, buy additional food, and make sure they stay inside during the storm. From watching this family get ready, kids will learn how to handle a hurricane if one should hit their town. Although there is good information in this book, one can’t help but wonder if it might have been better if written in a non-fiction format. As fiction, there isn’t really a plot, and kids may read it once or twice before losing interest. But kids love non-fiction when facts are presented in a fun way with good photos, and I think this book would have worked better in that format.